We are pupils that have been elected by our classmates to represent them on the Eco Committee meetings. We meet once every half term. 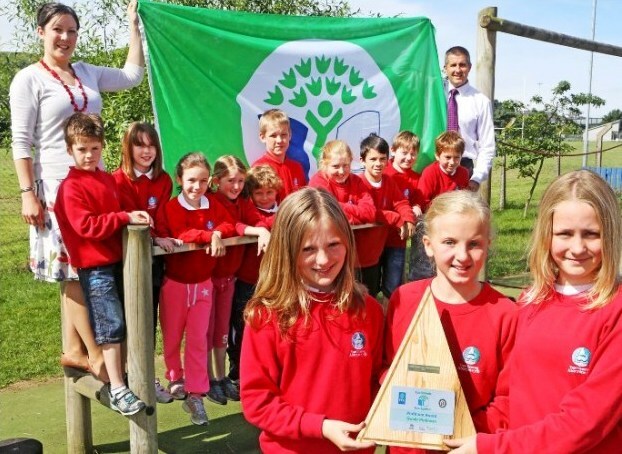 We are the committee responsible for all of the green issues within the school. Every class is responsible for one of these areas. Within our Global Citizenship field we look at the differences between Wales and developing countries, we also work closely with local groups to help with their projects. E.g last year we sent backpacks full of helpful school items to Malawi. We have an international day once a year to look at different countries. With the School Grounds, we develop different areas of the school each year. We plant trees each year also. With the Litter aspect, we have a Squad that collects the litter weekly and weighs it and then tells the rest of the school in assembly what they need to do to stop the litter getting onto the yard. With Water, we monitor the use of water within the school and we also measure the temperature. With Waste, we recycle everything possible, and look at our recycling bags and compare our waste to the rest of Europe. Within the Transport aspect, we look at how children come to school, and try to get them to walk or cycle to school as much as possible if it safe to do so. With Healthy Living we monitor the school lunch boxes, and explain a lot in the classes about healthy eating. Within the Energy topic, we have Energy Officers that go around classrooms giving prizes to the classrooms that switch off their lights when there is no one in the classrooms. As a school we are very proud that we were awarded the Platinum award this year for our continued work to sustain ac Eco School.